We will be having an open mat practice tomorrow night from 6:00-7:15 PM. It will be held in the new wrestling room. All grades 6th and under are welcome. Please pick up your t-shirts, warm-ups, and/or singlets at practice if you have not already. We will be scrimmaging in Goodhue on Thursday, January 8th. To take advantage of this opportunity, please sign up on the sheets at practice. 17 little guys wrestled in Plainview this past Saturday and several more wrestled in Pine Island on Tuesday. Earning their “Festivus for the Wrestivus” t-shirts at Plainview included: Trace Olson, Shea Norton, Gavin Seymour, Lincoln Toombs, Jake Moran, Nathan Haltom, Kaleb Lochner, Isaiah O’Reilly, Carl and Ben Murray, Gunner and Tanner Mancilman, Sam and Isaac Moore, and Ryan, Cain, and Owen Lexvold. Monday- Open mat practice in new wrestling room. 6:00-7:15 PM. All grades welcome. We had 24 wrestlers compete in the Goodhue tournament yesterday. Showing their wares were Jake Moran, Leo and Jent Beyer, Cole and Lucas Scheill, Sam and Isaac Moore, Gunner and Tanner Mancilman, Owen, Cain, and Ryan Lexvold, Kaleb Lochner, Ben Murray, Jack Krier, Carson Dillon, Ben Flaaen, Isaiah O’Reilly, Gabe Tupper, Mason Edstrom, Brennan Sheda, Ashton Macht, Nathan Haltom, and Jack Smothers. It’s great to have a turnout like this at a tournament or scrimmage so coaches can provide instant individual feedback and get an idea of what the group can improve on collectively. Thanks for getting your wrestlers there and great job boys! The singlets are scheduled to arrive tomorrow. If you haven’t already done so, please pick up your t-shirts, warm-ups, and/or singlets at practice. Monday- Practice. PreK through 3rd at 5:45. 4th through 6th at 6:45. 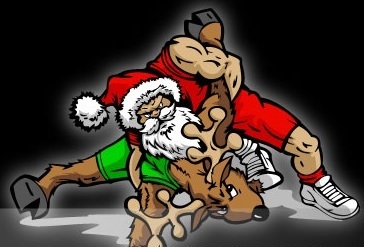 Kids- be extra good this week or Santa might just put you in an arm bar. That’s what happens to naughty reindeer. Happy Holidays! Thanks again to all our volunteers at the scrimmage last week and the ladies helping out at the concessions stand. Without your efforts this program would not exist. Does your wrestler have a friend that would like to try wrestling? Bring them along! Feel free to fill out this flyer and give to a friend. The warm-ups ordered at registration night are in. The t-shirts are also ready. You can pick these items up from Lacey at practice tomorrow night. The singlets are expected to be available next week. New to practice? Here is what to expect. There will be signup sheets in or near both wrestling rooms for the scrimmage at Kenyon Thursday. Please arrive at the Kenyon High School at 5:30, wrestling will begin at 5:45. Wrestlers will get into the event for free, parents and spectators will be charged admission. We should be done by the time the varsity is set to take on KW in a highly anticipated match-up. Monday- Practice. See above for details. Thursday- Scrimmage at Kenyon. Be sure to sign up. Friday- Cheer on the high school wrestlers as they take on Dover-Eyota in Mazeppa. Saturday- Tournament in Goodhue. Let’s see if we can get 20 wrestlers there! Wrestling fans: ARE YOU READY? 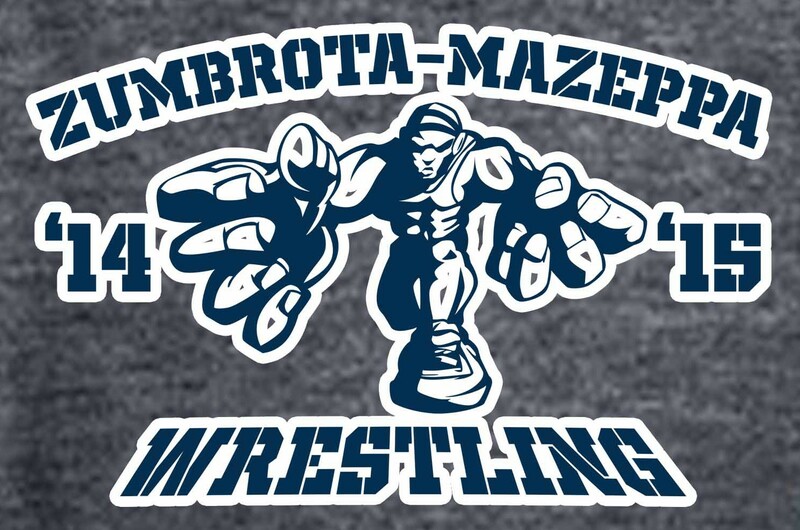 This season marks the 50th year of Zumbrota/Mazeppa wrestling. The dual between ZM and Dover-Eyota on Friday, December 19th has been designated Alumni Recognition Night. All former Zumbrota Tigers, Mazeppa Indians, and ZM Cougars are welcomed to attend to help celebrate this event. No introductions will be made, but please come and visit with old team members and talk about matches and meets that took place years ago. Wayne Anderson, a local sports historian, has located all the old varsity team pictures of the past 50 years. The pictures will be on display in the hallway outside the Mazeppa gym during the dual. Please let all your old team members know and come watch the exciting current crop of ZM wrestlers! Reminder: Clothing orders are due tonight…be sure to get your orders turned in @ practice or drop off @ Coach Steffen’s house. Thank you! 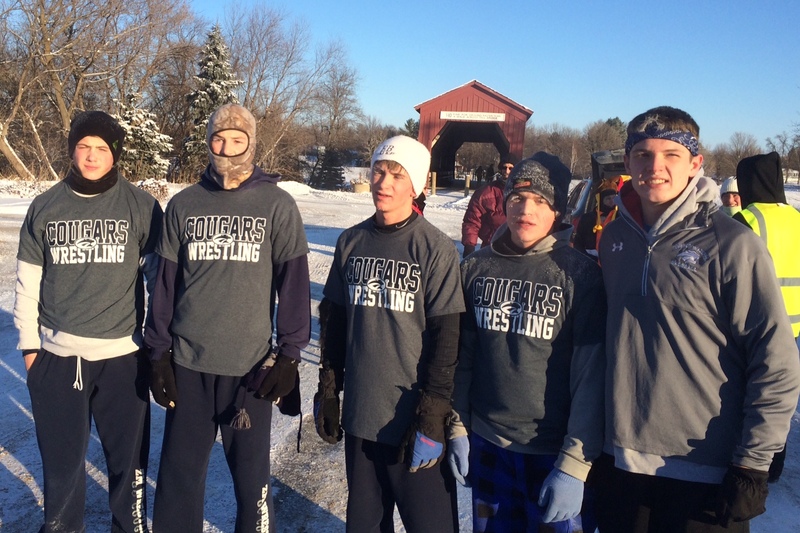 ZM Wrestling had 5 wrestlers run the annual Turkey Trot (5k) in Zumbrota on Thursday morning…great job guys!